​Kofi Annan, one of the world's most celebrated diplomats and a charismatic symbol of the United Nations who rose through its ranks to become the first black African secretary general, has died. He was 80. The president of Ghana, where Annan was born, said in a tweet that "I am ... comforted by the information, after speaking to [Annan's wife] Nane Maria, that he died peacefully in his sleep." Kofi Annan was a great champion of peace, development ,human rights and a formidable leader of the <a href="https://twitter.com/UN?ref_src=twsrc%5Etfw">@UN</a>. With serene calm and determination, he consistently stood up for the value and necessity of international cooperation.The best tribute we can give Kofi Annan is to do the same. Annan spent virtually his entire career as an administrator in the United Nations. His aristocratic style, cool-tempered elegance and political savvy helped guide his ascent to become its seventh secretary general, and the first hired from within. He served two terms from Jan. 1, 1997, to Dec. 31, 2006, capped nearly mid-way when he and the UN were jointly awarded the Nobel Peace Prize in 2001. When he departed from the United Nations, he left behind a global organization far more aggressively engaged in peacekeeping and fighting poverty, setting the framework for the UN's 21st-century response to mass atrocities and its emphasis on human rights and development. "Kofi Annan was a guiding force for good," current UN Secretary General Antonio Guterres said. "It is with profound sadness that I learned of his passing. In many ways, Kofi Annan was the United Nations. He rose through the ranks to lead the organization into the new millennium with matchless dignity and determination." Even out of office, Annan never completely left the UN orbit. He returned in special roles, including as the UN-Arab League's special envoy to Syria in 2012. He remained a powerful advocate for global causes through his eponymous foundation. 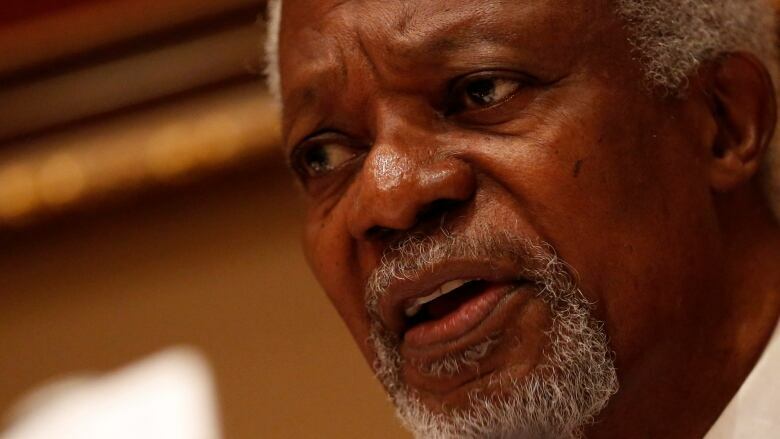 Annan took on the top UN post six years after the collapse of the Soviet Union and presided during a decade when the world united against terrorism after the Sept. 11 attacks — then divided deeply over the U.S.-led war against Iraq. The U.S. relationship tested him as a world diplomatic leader. "I think that my darkest moment was the Iraq war, and the fact that we could not stop it," Annan said in a February 2013 interview with Time magazine to mark the publication of his memoir, Interventions: A Life in War and Peace. "So they decided to go without the council. But I think the council was right in not sanctioning the war," he said. "Could you imagine if the UN had endorsed the war in Iraq, what our reputation would be like? Although at that point, President [George W.] Bush said the UN was headed toward irrelevance, because we had not supported the war. But now we know better." Despite his well-honed diplomatic skills, Annan was never afraid to speak candidly. That didn't always win him fans, particularly in the case of Bush's administration, with whom Annan's camp spent much time bickering. Much of his second term was spent at odds with the United States, the UN's biggest contributor, as he tried to lean on the nation to pay almost $2 billion in arrears. He shared his middle name Atta — "twin" in Ghana's Akan language — with a twin sister, Efua. He became fluent in English, French and several African languages, attending an elite boarding school and the University of Science and Technology in Kumasi. He finished his undergraduate work in economics at Macalester College in St. Paul, Minnesota, in 1961. From there he went to Geneva, where he began his graduate studies in international affairs and launched his UN career. Just before becoming secretary general, Annan served as UN peacekeeping chief and as special envoy to the former Yugoslavia, where he oversaw a transition in Bosnia from UN protective forces to NATO-led troops. In both cases, the UN had deployed troops under Annan's command, but they failed to save the lives of the civilians they were mandated to protect. Annan offered apologies, but ignored calls to resign by U.S. Republican lawmakers. After becoming secretary general, he called for UN reports on those two debacles — and they were highly critical of his management. Annan sought to strengthen the UN's management, coherence and accountability, efforts that required huge investments in training and technology, a new whistleblower policy and financial disclosure requirements. 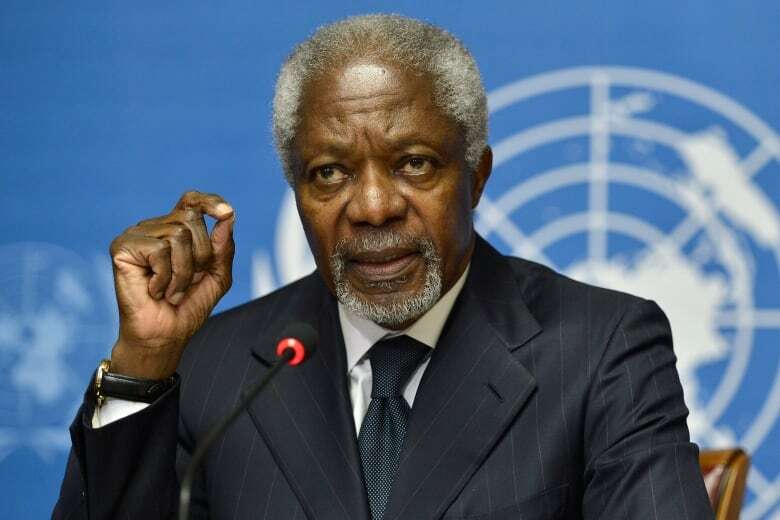 Annan was chief architect of what became known as the Millennium Development Goals, and played a central role in creating the Global Fund to Fight AIDS, Tuberculosis and Malaria and the UN's first counter-terrorism strategy. Annan's uncontested election to a second term was unprecedented, reflecting the overwhelming support he enjoyed from both rich and poor countries. Timothy Wirth, president of the United Nations Foundation, which disburses Ted Turner's $1 billion pledge to UN causes, hailed "a saint-like sense about him." An independent report criticized the secretary general for being too complacent, saying he should have done more to investigate matters even if he was not involved with the awarding of the contract. World leaders agreed to create an internal UN ethics office, but a major overhaul of the UN's outdated management practices and operating procedures was left to Annan's successor, Ban Ki-moon. In his memoir, Annan recognized the costs of taking on the world's top diplomatic job, joking that "SG," for secretary general, also signified "scapegoat" around UN headquarters. One person who knew and worked with Annan is Paul Heinbecker, who was Canada's ambassador to the UN from 2000 to 2003. "He was an exceptional person," Heinbecker told CBC News. "He was a guy who could combine great intelligence with humanity. He could talk to the world's thugs and the man on the street ... he was practically the definition of diplomacy." Former prime minister Paul Martin, whose tenure overlapped with Annan's as secretary-general, described him as "one of the greats." "He had a very broad vision which enveloped everybody, and he was always looking ahead," he told The Canadian Press. "He was one of those few people who were able to understand it wasn't just the rich and powerful nations that counted ... that the rich and powerful nations were going to be very dependent, ultimately, on the poorer nations doing well." Martin said his strongest memory of his friend was a phone conversation the two had after he retired from politics, when Annan called to ask Martin to co-chair a body that dealt with the future of the African Development Bank. Their long conversation was, as usual, "about the world, and how we all fit into it," he said. After leaving his high-profile UN perch, Annan didn't let up. In 2007, his Geneva-based foundation was created. That year he helped broker peace in Kenya, where election violence had killed over 1,000 people. As special envoy to Syria in 2012, Annan won international backing for a six-point plan for peace. The UN deployed a 300-member observer force to monitor a ceasefire, but peace never took hold and Annan was unable to surmount the bitter stalemate among Security Council powers. He resigned in frustration seven months into the job, as the civil war raged on.